Download this Spreadsheet file here and open it in your Spreadsheet editor like MS Excel or OpenOffice. Next Add your products to the Spreadsheet, follow the guides on the spreadsheet if you are not sure. Please note it may take between 1 - 5 Business Days for your products to reflect. 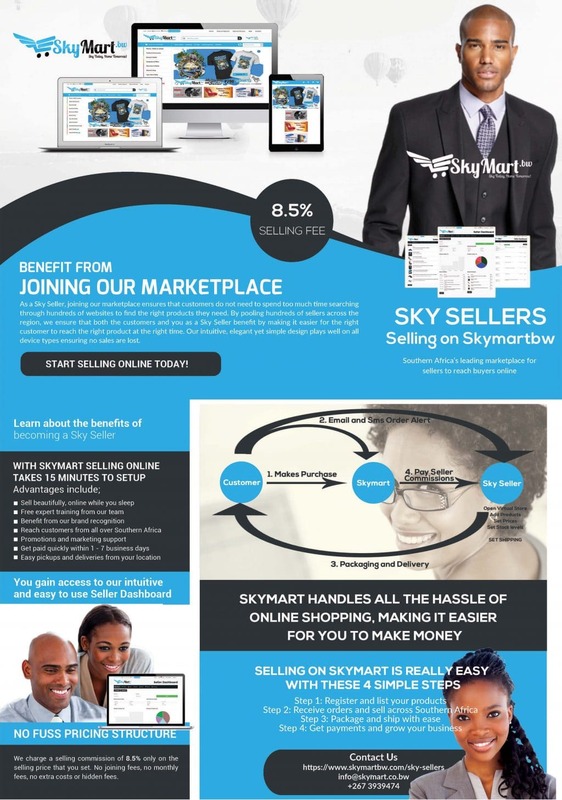 Each and every Sky Seller that has agreed to setup their store should adhere to the following rules and regulations. We are working on a 3 point warning and expulsion system. On your third strike it is goodbye. All products listed should constantly be updated especially regarding stock levels. If a customer buys an item that is listed in stock, but the seller realises they have no stock, a warning will be issued. All products listed under your store should be legal within the constitution of Botswana. Honor your commitment to buy and sell. Any attempt to manipulate ratings,feedback or reviews is prohibited. Multiple seller accounts are prohibited,if you have a legitimate business need for a second account, you can apply for an exception for this policy. Do not place any contact numbers on banners, logos, product images or descriptions.